A zany romantic comedy in a 'Rumiko-Takahashi-kind-of-way', Love Hina is one of those rare shows, like Tenchi Muyo, where the characters grow on you and you come to love them as part of your family. 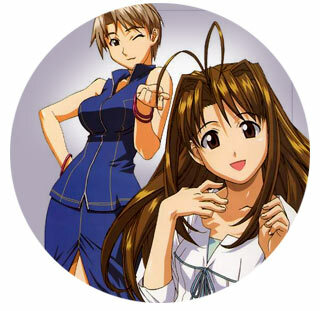 With Naru being (literally) the girl of his dreams, Love Hina is a formula show with a refreshing twist. While watching the first few episodes, we often had the urge to play Offspring's "Self Esteem", because it seemed to relate so closely! For anyone who's had to deal with unrequited love (and haven't we all), Love Hina is about a loser with a shot at happiness — will he get the girl or screw up? Watch and find out - the journey is the reward! Love Hina - which won a prestigious Kodansha Manga of the Year award for its creator - is Akamatsu Ken's 2nd major manga series. His earlier AI Ga Tomaranai - a sort of cyber love comedy - ran for 8 volumes in the early-to-mid-90's. The focus of this manga series is romance, and this manga is somewhat R rated - but done in good taste. In this first issue our hero Keitaro's dream is to attend Tokyo University with his childhood sweetheart, a girl who he hasn't seen in years. Now he's failed the entrance exams and is in danger of losing his dream again if he doesn't stay focused. In a desperate effort to go into seclusion and study for his entrance exams, he volunteers to take over running his grandmother's hotel. Yet, Keitaro is about to get motivated when he discovers that one of his tenants is his childhood crush! This manga is 200 pages of fun in glorious black and white.